If regular photos have become way too boring for you, and you’d like to spice things up a bit, then you are definitely going to love this new iOS app called Phhhoto. How is Phhhoto different than other image editing apps out there? Well, instead of taking just one picture, Phhhoto takes a series of pictures and puts them together, creating an animated image, kind of like a GIF. At the end of your editing process, you can add a filter or some grain to your animated image, and then post it online. Yes, Phhhoto also offers all the benefits of a social network – you can find friends, search hashtags, share your GIFs across different platforms, etc. If you tap on the app’s “WOW” tab (also found on the Phhhoto’s official website), you’ll be able to browse through a number of really cool looking (sometimes mesmerizing) animated images, such as this one. 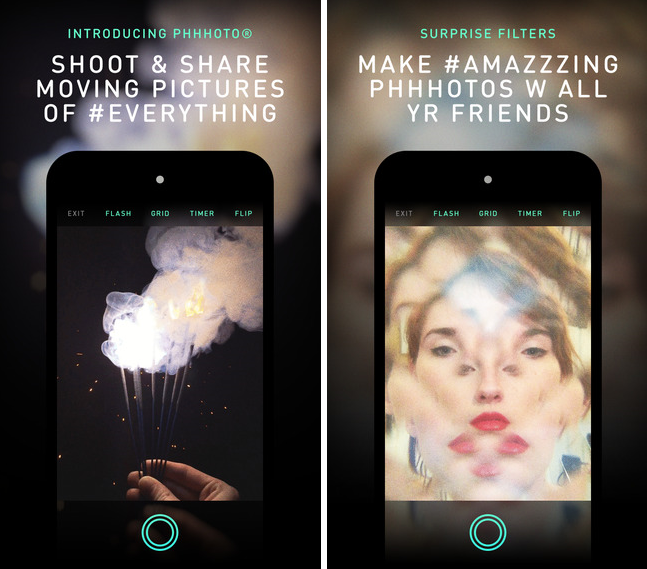 Phhhoto is available for download on the App Store, and there’s an Android version in the works, too. The app requires iOS 7.0 or later, and it’s compatible with the iPhone, iPad, and iPod touch. This entry was posted in Uncategorized and tagged App, iOS. Bookmark the permalink.